The commissioner of School Education and Ex Officio Project Director of APMS/RMSA has issued Rc No: 550 regarding of AP model school admissions for the academic year 2020-21. According to Rc 550 AP model school notification 2020 will be released on 5th January 2020 through leading news papers for conducting 6th class entrance test for admission into 164 model schools across the Andhra Pradesh State. Smt K Sandhya Rani said, ap model school 6th class admission test will be held on 8th April 2020. 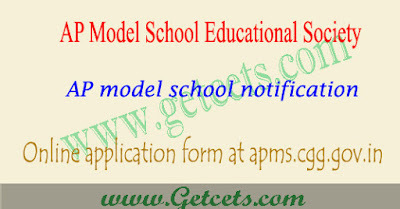 Complete AP model school 6th class admission schedule released by the DSE Andhra Pradesh. This entrance exam is released to give admissions in the 6th class in model schools. So, students who want to study the course under this schools can immediately apply for the AP model school 2020 6th class entrance exam. For AP model school entrance exam admissions, visit official website apms.cgg.gov.in. Please check out the complete details from the following link.